with complete certification as shown on this page. is also available in Aluminium. unit a very versatile device. Weight for the SS 316 version, 815 gram. This housing is available in SS 316, and is economically priced to meet to DIN B dimensions and requirements. 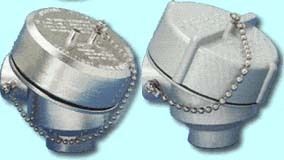 It can accommodate a medium sized temperature transmitter or terminal block, 50mm in diameter. The PG16 version only comes with a cable gland. 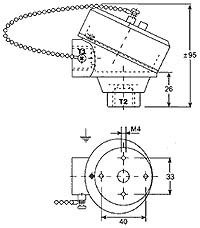 The processide dimensions are identical to the DIN B head, so they can replace them in full. Weight fir the SS 316 version, 360 gram. This housing is available in SS 316 and is designed speciallyfor large temperature transmitters. The housing will accommodate a transmitter 65 mm (2.5") indiameter and approximately 45 mm (1.8") in height. It meets the requirements of IP65 NEMA 4. The weight of theSS 316 version is 560 grams.